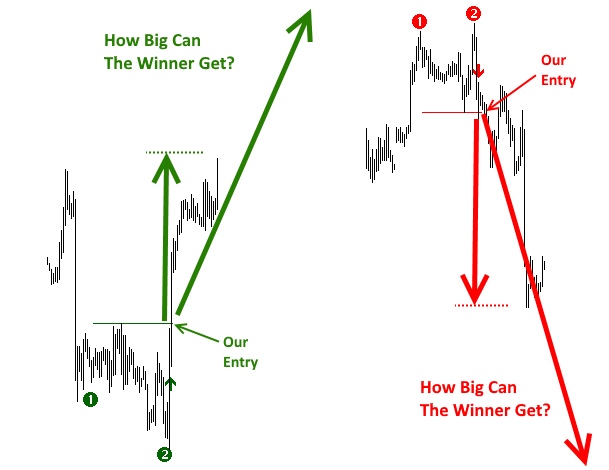 Have you been struggling to find a trading strategy that can consistently return profits? If you have been on the lookout for a strategy but haven’t found one yet, or if you like the concept of combining technical indicators with price action techniques, then this day trading strategy will not disappoint you! 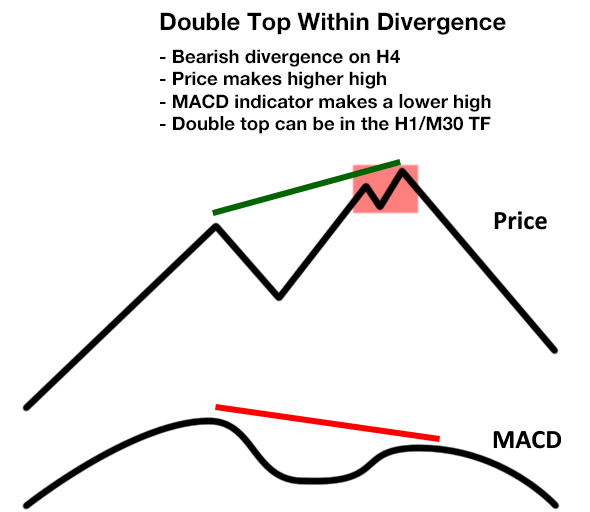 While there are many strategies that one can develop, the MACD divergence with a combination of double top and bottom price action method can yield big winning trades. But before we go any further, this is a strategy that requires you to hold trades overnight and at times over a couple of days as well. If swing trading is something that interests you, then this is a strategy worth exploring. 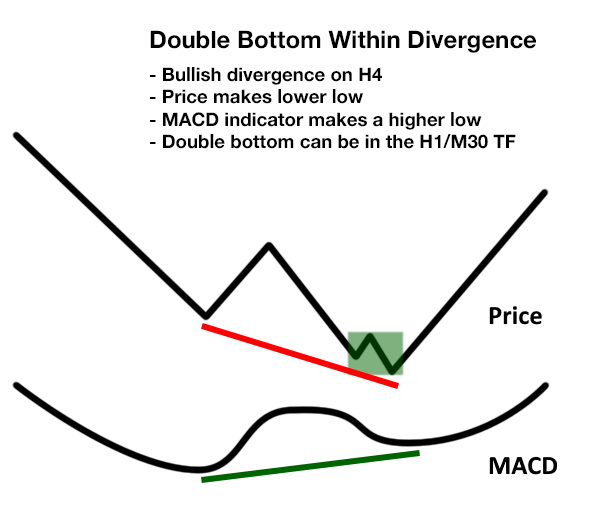 The MACD divergence with double top and bottom trading strategy can give big results as it allows you to enter at the major trend reversals. And that’s not all! 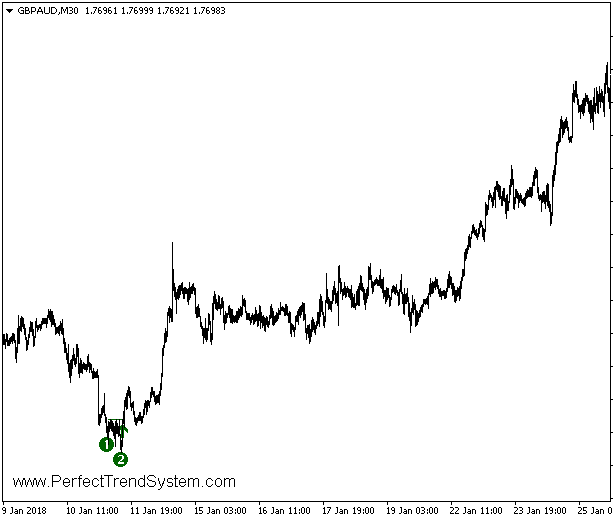 You will be able to identify the trend reversals on a regular basis giving you an advantage over the rest. 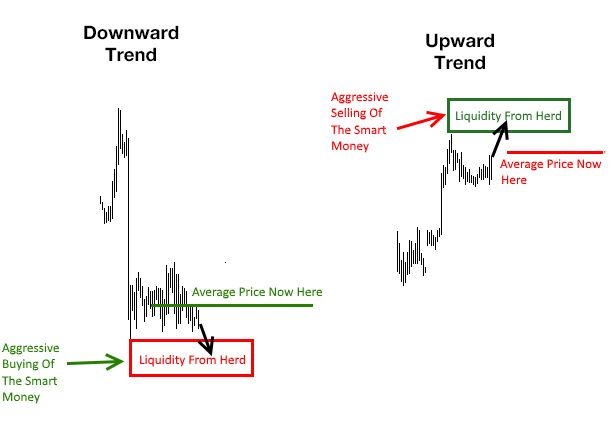 This trading strategy combines trend reversals of a larger and a smaller time frame. So how does this strategy work, you might be asking. There is no magic crystal ball. 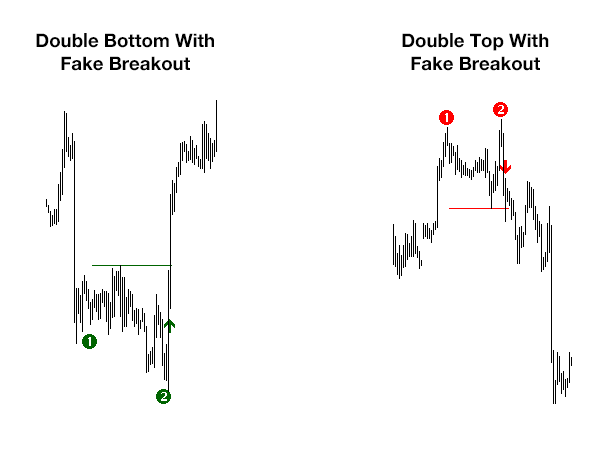 This strategy is based on the free to use Double Top / Bottom Indicator. This indicator takes advantage of the cycles in the market created by the Smart Money! If you have even a little experience of trading, you will know that the market cycles are comprised of the following phases. The price action pattern in the above screenshots has many names. 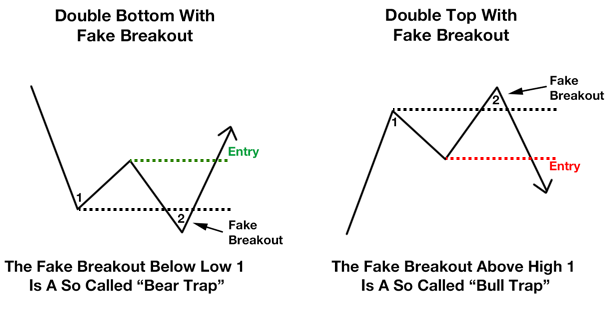 Some might call it the Bear and Bull trap method or more commonly the Double top and bottom pattern with a fake breakout. It is important to understand the market psychology behind the patterns. They are formed because the smart money accumulate positions over time. This happens because the price is at the best possible level before changing direction of the trend. 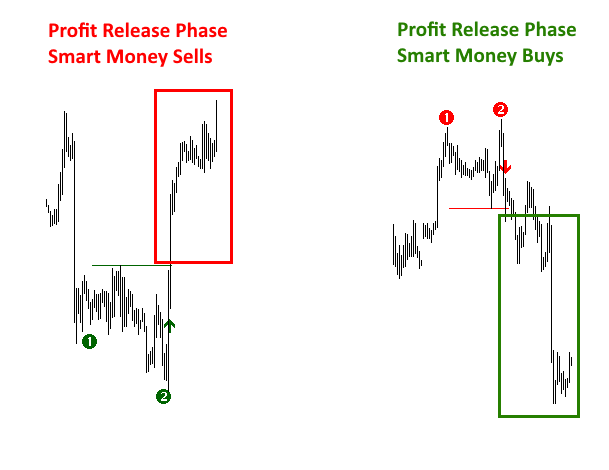 Take a look at the next two screenshots which give a schematic outline of how the reversal patterns are formed. You can also notice the fake breakout and how our indicator triggers the entry signal just ahead of the trend reversal. As you can see in the above diagrams, price tends to peak a bit lower (and higher) before the reversal begins. That is smart money at work, as they squeeze your positions, fooling you into thinking that the trend will continue. Most likely, your stops would be hit at this point. The moment you exit your position, you will be left disappointed as price reverses and changes the trend. Let’s take a closer look at this reversal pattern so you can understand how you can make consistent profits with this method. how you can take advantage of this method? Before we begin, let’s define what the smart money is. The smart money is a term used to refer to the role of the market maker, also known as the institutional banks. The smart money takes advantage of the imbalance that exists temporarily. Most often, it is the retail trader, you, who gets caught up in this imbalance! When the retail crowd starts to build up the short positions at the price level, the market makers end up having a long position. But this is a big risk for the smart money as they are on the long side and they are potentially at risk. The same rule also applies at the markets near the bottom. Retail traders start to crowd into the long orders leaving the smart money on the other side, holding short positions. As these patterns form, you will notice that the retail trading crowd is anticipating a new trend to form. But this comes at the cost that the smart money is positioned in the opposite direction of the trend. Doesn’t this smell like a big risk for you, if you were the smart money? Take a look at the next two screenshots to understand what happens during the trend from the perspective of a market maker. Starting with the Downward Trend illustration, you can see that the retail crowd is a net seller, leaving the market maker to hold a net long position. As the net long positions build, the average price is much higher than the actual price (as denoted by the green horizontal line). This means that the market maker is deep in the red, holding net long positions which is higher than the actual average price. It is the same story on the Upward Trend. The picture shows how the market maker is now sitting with a short position which is again at a worse price than the average actual price, as marked by the red horizontal line. Before we get any further, it is important to understand that the market maker is the one holding the largest position. They are also privy to more information about the market and can move prices significantly. 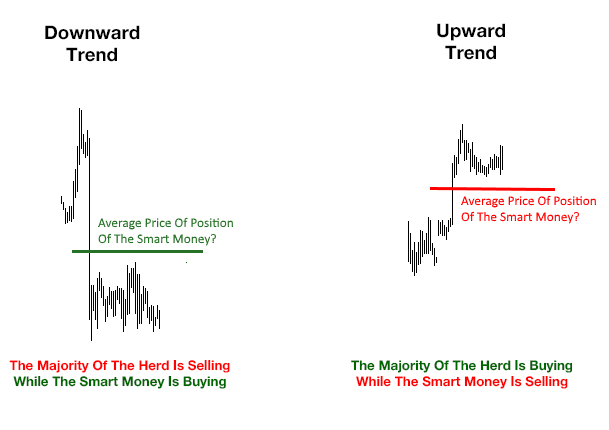 When the market maker wants to reverse the direction of the trend, by optimizing the average price of their positions, they can shift the market trends. The market makers do this in order to remove the risk from the positions that they hold. They know that liquidity rises when prices reach a new high or a low. The next screenshot will show you exactly the levels of liquidity at the highs and the lows in price. 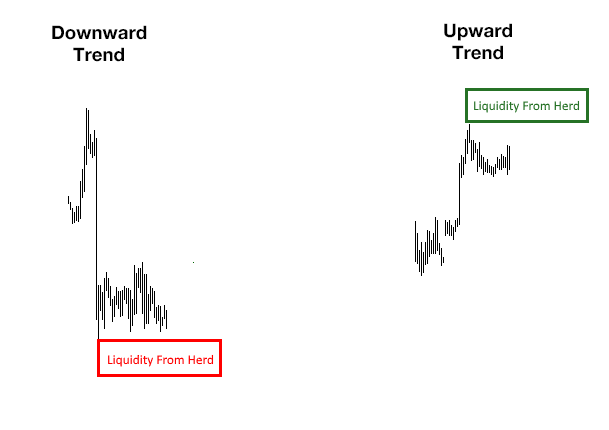 When price is at the lows or the highs and when the market maker wants to use these high liquidity levels to get a better average price, they can simply push prices toward these levels. When liquidity rises, the market maker absorbs all the incoming orders. This stops price from moving. When price makes a big move in terms of volume or trades, but the price level itself barely moves, you can then tell that the market maker is absorbing the orders while increasing their positions. The next two screenshots give an example of the outcome of increasing the position size at the desired best price from a market maker’s perspective. The average price of the position for the market maker is now closer to the actual price. Once the market makers move the price to their desired level and the liquidity is absorbed, the smart money now prepares to take advantage of their accumulated positions. As liquidity dries up, the trend stops for a moment. As a final push, the market maker builds positions one last time. This final phase in the accumulation phase further reverses direction of the price movement. You will notice this with candlestick patterns such as pin bars and other reversal candlestick patterns. At this point, the double top or double bottom becomes evident on the chart. The moment retail traders identify this pattern, the weak holders start to offload their positions. As a result, the neckline of the double top or bottom pattern breaks. This is the same level at which the entry signal of the FREE Double Top/Bottom Indicator is triggered. Can you already see the advantage have? Following this, rapid price action movement in the opposite direction occurs to the previous trend. This rapid price action is the release phase from the market maker. They exit their previously accumulated positions and do so with big profits. As the indicator signals you to enter at the break of the neckline of the double top or double bottom pattern, we enter the market at the very precise point of when the market maker makes this big move. As a result, it increases the size of your winning trades, which is of course dependent on how big a move that ultimately comes about due to the market maker’s action. In this next part of the article, we will show you how to select these powerful setups and the potential to make big rewards consistently. Watch the next video to see how the indicator makes a 128% profit with just 35 trades. What’s more, the risk is just 2% per trade, giving you a huge reward/risk ratio. Although the raw signals from the indicator can give you big results, I would recommend that you pick and choose the signals that give you an edge. Trading is very simple. It is all about gaining an edge in the markets. The better grip you have in understanding what is happening, the easier it is for you to handle the emotional and psychological aspect of trading. How to selectively choose signals that can win big? My experience with the Free Double top/bottom as mentioned in my Telegram Group (you will also get access to this group after downloading the FREE indicator) is that members have larger success when trading on the 30-minute and 1-hour time frames. The reason behind this is because the M30 and H1 timeframes offer a good balance between the number of signals and the extent, and hence the impact, of the move from the winning trades. For example, if you have two signals from the M30 chart time frame (as shown in the double top/bottom screenshots), you can trade successfully by just focusing on the M30 chart time frame. 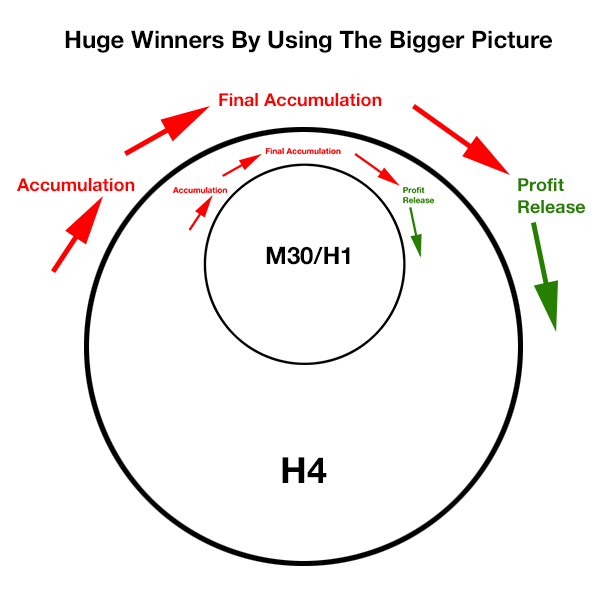 However, if you simply focus on the M30 time frame in isolation, you would never know when you can expect a big winning move. Therefore, you will have to choose a smaller or a more reasonable target for all your trades. The next illustration shows the market maker’s accumulation cycle on a smaller scale. You can see the trapping or the consolidation phase, which is the final accumulation phase and the subsequent release of the profits on the 30-minute chart. You might start to wonder how to catch these big movements and win consistently? Well, the answer to this is to choose only those signals that have an edge from the bigger picture, using the Double Top/Bottom FREE indicator. From the bigger time frame, you can form your own picture and therefore choose the best signal on the lower time frame. In the next section of the article, I will show you how you can use divergence on the H4 time frame to select the best Double Top/Bottom signals on the 30-minute and 1-hour charts. 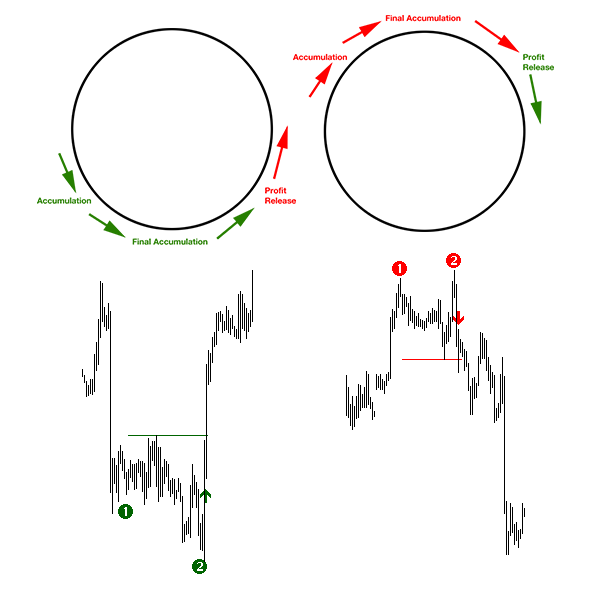 To put it simply, if you trade the double bottoms on the M30 or H1 time frame within the bullish divergence formed on the 4-hour chart, then you are actually trading the market maker’s cycle within the larger (H4) cycle. Using this approach of multi-time frame analysis, you can immensely improve your profits with only a relatively small risk to bear. The next illustration will show how this works. 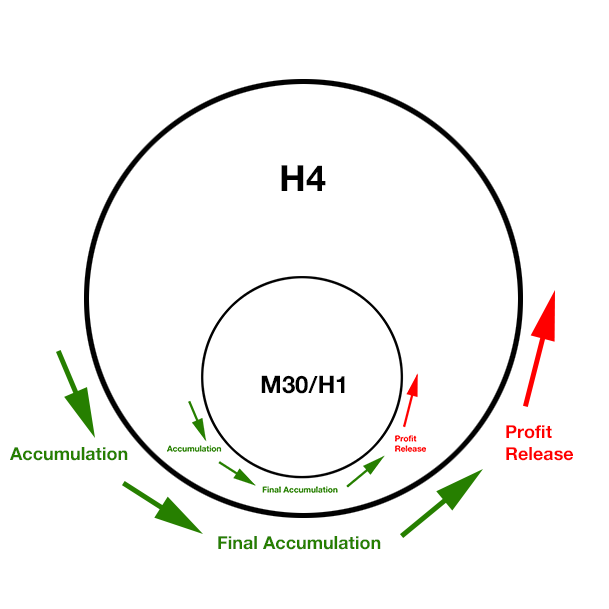 You can see the two nested cycles, the H4 and the M30/H1. In the next chart, you can see the nested cycles. Within the bullish divergence, a double bottom forms on the lower time frame (green rectangle). This results in a big winning move to the upside. Following this method, you can be certain to capture big winning trades from the M30/H1 time frame that occur within their respective bullish or bearish divergences on the H4 time frame. Here, you would be able to enter with a tight stop loss from the entry and participate in a potentially big move ahead. The big move comes just as market makers start to release their profits after the final phase of accumulation. Now take a look at the next chart which illustrates the above from a perspective of price. 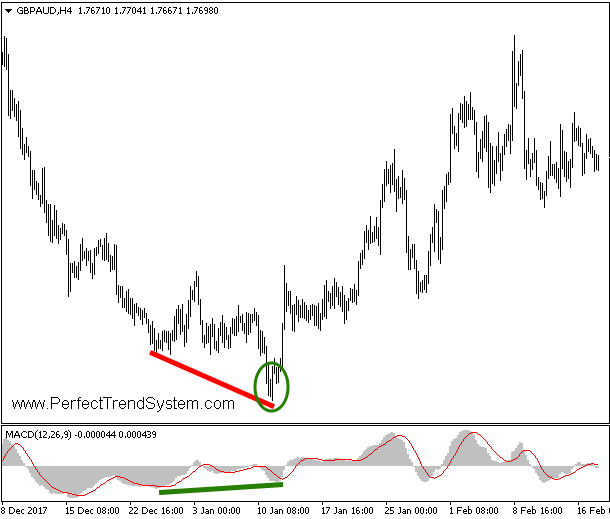 A double top pattern forms on the smaller time frame (M30/H1) within the divergence of the H4 time frame. These signals occur frequently. If you are patient enough to wait for these signals, then it is highly possible for you to improve your trading. This double bottom signal, if taken at the entry level, i.e., the break of the neckline, would have given you 17 times the risk. In other words, if you risked 2% of your capital, your reward would have been a massive 34%. Based on the above, pause and ask yourself, how many of such trades you need per year to be profitable? Try out this trading system. The key to trading success is within your reach. All you need to do is to be patient for these setups to be formed. The double top/bottom indicator will alert you when the signals are formed. It is up to you for how long you want to hold these trades. You can close them for a quick profit within the intraday cycle, or you can keep your trades open until the final target is reached. Get an edge by combining the big picture with the FREE double top/bottom indicator.